Welcome to Khloes Kittens Cattery. We are located in Essex County New Jersey (5 minutes from the Willowbrook mall in Wayne- 15 minutes from New York City and 1.5 hours from Philadelphia, Pennsylvania. My name is Jo Ann and I have been a cat breeder breeding Persian and Himalayan kittens for quite some time. The kittens health and well being are my number one priority above anything else. All my parents are fully vaccinated and have been tested for all diseases and are negative (pkd/fiv/felv) and are also ring worm negative and flea-free. We are a cageless in home cattery. Khloes Kittens is focused on the health and well being of our cats and kittens, and the promotion of the Persian, Himalayan, and Exotic breeds. Our kittens are bred and raised in a loving home environment with very personal attention throughout, and we are dedicated to placing them in forever homes where we will have confidence they will be loved, cared for and can thrive. The kittens are raised around my young children and many other animals so they are very well socialized and have an amazingly friendly temperament by the time they go to their forever homes. At Khloes Kittens, we have kittens for sale yet so much more. These kittens are our babies and are a part of our family until they go home to you. We are dedicated to nurturing healthy, happy, and beautiful kittens, and preparing them to become a treasured member of your family. The kittens cannot leave the cattery until they are completely weaned off their mom, litter and scratching post trained, and are well socialized. (usually between 7-8 weeks old). They are sold as indoor pets only and come with a contract which states a health guarantee. If you are ready to reserve your new family member you can email, or text me however I can not agree to the sale of any kitten unless I speak to the individual who the kitten will be residing with. Serious inquiries only please. My telephone number is (201)398-6766. You can click the menu tab(scroll up to the top of the page) then click the available kittens tab to see what we have available or which type we are expecting and when. 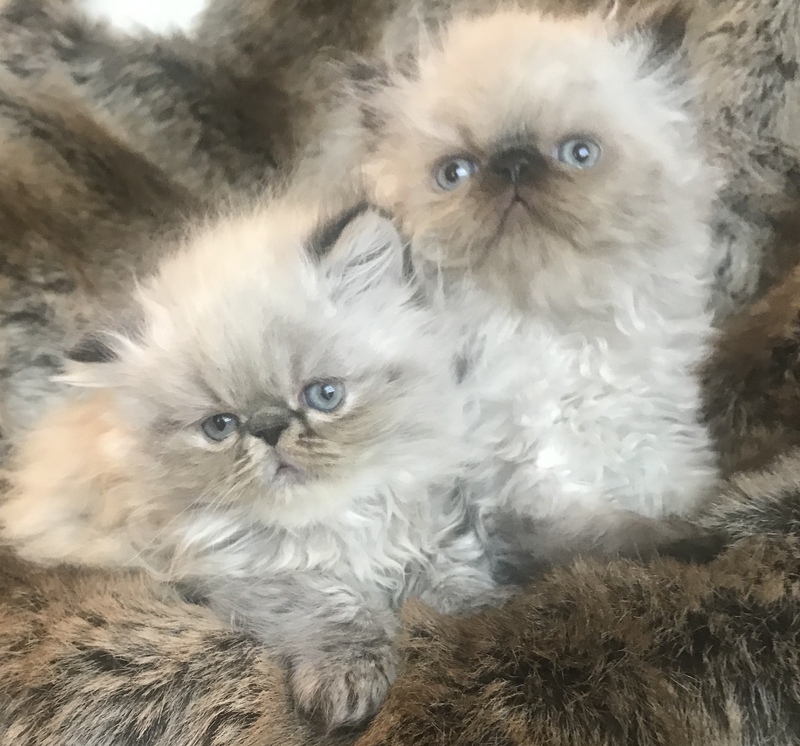 The types of kittens for sale that we work with are Seal point, Blue point, Flame point, Cream point, Tortie point, Blue Cream Point, various colored Lynx points, Chocolate point , Lilac point himalayans and Persians, and exotic short hairs as well. Prices range from $900-$2000. (pricing varies depending on coloring, rarity, and whether or not the kitten is an exotic or not). We breed both the traditional doll-face and flat-faced Persian and Himalayan kittens and all of our babies have blue eyes only. We also have exotics which their eyes are larger. We NEVER Inbreed NOR over breed, and we do NOT stud out our males. As previously stated the health and well-being of all our Persian, Himalayan, and Exotic cats and kittens is our number one priority. We do deliver our babies to you for a fee(the fee depends on your location) We do not ship as we personally feel it can traumatize a kitten and affect the kitten’s personality. Once a Khloes Kittens cat is placed in a home, that home becomes part of the Khloes Kittens extended family. Khloes Kittens parents are encouraged and welcome to call anytime for advice or questions about their kitty. We also love getting pictures of our past babies. We are happy to answer any inquiries on Persian and Himalayan kittens. Feel free to e-mail me, Jo Ann at: khloeskittens@yahoo.com or call anytime at (201)398-6766. Our Persian and Himalayan kittens are very Sweet and Fluffy with a wonderful “purrrsonality” to match it! They are looking forward to meeting you and find their loving forever home. Please note-we do not accept deposits until our kittens are at least three weeks old to ensure the kittens are healthy and thriving. A kitten is a long term commitment, so please be sure you are ready, willing and able to care for your cat as all deposits are non-refundable. (In the rare event that between the time a deposit is received and the time the kitten leaves we see there is an issue with your kitten then we will absolutely refund 100% of your deposit). *Please be advised that it is your responsibility to know whether or not you or a family member in your household is allergic to cats or not. This is not a valid reason for a refund. If you are unsure we recommend that you or your family member be tested prior to sending in your non-refundable deposit. Thank you.